The discard pile can be treasure or trash, and picking from this mixed bag comes with a set of concerns that shiny, newly-minted organizations don’t have to contend with. There are potential pitfalls a-plenty, but with a combination of well-deployed legacy and fresh direction, reviving an old brand can become a worthwhile endeavor. Here are 10 thoughts for anyone who aims to reclaim an aging brand and reconfigure it for today’s world. These nuggets might be the difference between dumpster diving and panning for gold. 1: What drives you to drive the brand? There are many motives for reviving a dormant brand, and most of them revolve around the possibility of good ROI. This is business after all, but like Billy Joel said, you gotta have soul. If your organization merely sees that brand as intellectual property to be exploited, or are looking to squeeze the last drops of blood out of it, you might think twice. Better to bring it back to life because there is something within worth saving — passion or ideas worth mining. Is there an untapped promise or potential in that comatose brand? How does it relate to what you want to do? If you can successfully coax out that unique spark and marshal it on your behalf, the profit will eventually follow. 2: Assess your assets. Where are the valuables stored, and what exactly is your team getting when inheriting this brand? What bits of value does this brand still have? A recognizable logo? Memorable colors? Taglines or famous catchphrases? Or maybe it’s a loose association or connection to a cultural ethos? In this stage of the process, it’s important to dig deep and do the necessary research to understand what’s still valuable. Are the strengths transferable? Sometimes it’s the subtleties and nuances — echos of a brand’s mark in the world — that can hold the most lasting value. 3: Standing for something. Whether it’s today or tomorrow, you need to ascertain the foundation — what does the brand stand for? At its apex, what intangibles and meaning did it contain? Can it represent those same things today, or does it need to embrace a new spectrum of symbolism to survive (and thrive) in the current marketplace? 4: What do all the people know? Where public-facing brands are concerned, it’s all about the audience. You might see something redeeming in that sleepy brand of coffee or stereo manufacturer’s name, but what do people out in the world think about your new treasure? How do they relate to the brand today? Good research will be able to help uncover the current feelings and associations the brand has among the people who matter. 5: Find your fan base. Do niches and segments of brand lovers still exist? One of the biggest benefits of claiming an old brand is finding the dedicated pockets of true-believers who still carry a torch for your reawakened brand. In it’s absence, they wrote, created, argued, and reminisced about the products, services, or benefits your brand once offered. Can you tap into those fans? Will those sparks turn into a towering inferno as you help mobilize these self-made evangelists? These die-hards can be your best friends or your worst enemies, depending on how you play your hand. While they might be devoted to the name or cause, they will be a major headache to your team if you can’t live up to the legacy of the original name (at least as they might see it). Sometimes re-engaging with a brand’s devotees can be more arduous than building a brand new audience. Zealots come in all flavors — choruses of angels or a busloads of devils. 6: Has time healed all wounds? Sometimes history is kind, and the rough edges or missteps of organizations get lost to time. But in other situations, one single act can turn a company name into a hated buzzword. Have the years been kind to your brand? What timely facets and associations have evaporated? History can be a helpful benchmark for what is still valuable — because sometimes cream rises to the top. What has stood the test of time? Those might be the brand assets worth preserving. 7: Evolution or death! 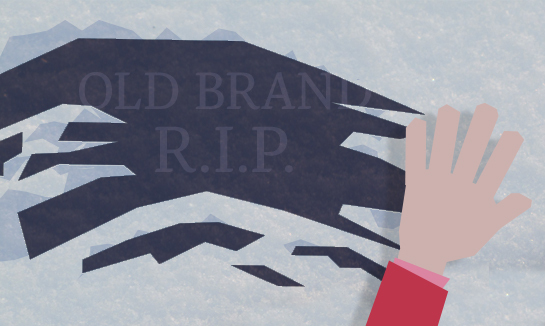 Like sharks, stagnant brands die, regardless of how old they are. Remember that all brands need to grow and evolve, and if your brand isn’t moving forward, adapting, and morphing to fit the needs of the culture and marketplace, it’s heading backwards. And that’s how the brand got swept into the dustbin in the first place. 8: Show me the skeletons. While it might be cheaper to build on an existing foundation, you have to do your due diligence as well. Brands are no different. Sometimes you’re also inheriting the dirty laundry and rotten floorboards in forgotten corners of the house. Will those landmines hamstring your new efforts? It’s probably best to consider if you’re equipped to deal with the imagined worst-case scenario. 9: Grey isn’t always gold. Not all old things are worth reviving. LPs might be cool, but is anyone itching to fire up their old 8-track player? There’s a difference between momentary fashion and a brand hook that can evolve back into a sustainable business model. Sometimes that layer of dust is just irrelevancy, and the savvy marketers should be able to spot the difference through the cobwebs. 10: Have a plan. Crafting and building brands is not like investing. Stock values move on just one axis — they can go up or down. But brands are more mercurial, and require more than just capital to refresh them. These rebuilt brands need passion, vision, and strategic planning for the future in order to grow well. Forgo the passion, and brand resurrection just becomes the mechanical act of squeezing more blood from the same stone. Think brand love will win breed success alone? Unfortunately, passion isn’t a business plan. Without a strategy for growth, development, and communication, your brand will never evolve into what it could be. Still, when it comes to reviving a brand, true love and care for the brand will shine more brightly than a holding company’s financial stake. And brand audiences can sense true passion, because it shows itself in all touchpoints for a particular service or product. When brands are reborn, often the intangibles are the only things left. Emotions, associations, and half-remembered connections are the clay that can be molded and shaped for new purposes — those of your new endeavor. The teams who can harness those spirits and weave them into provocative brand stories are the ones who will win the day. Shinola, watches, leather goods, and bicycles all made in Detroit. Previously makers of shoe-polish. Shinola is experiencing strong sales, great buzz, and success because they’ve zealously stuck to their brand’s plan and ethos. Their leadership team also seem to have a deep understanding of how much to accentuate or downplay certain aspects of the brand’s name and heritage for the best results. Full story by Fast Company. Polaroid, digital and imaging products. Previously innovators and originators of instant film. “It’s one of the famous brands, like Rolex, Nike, Coca-Cola,” Polaroid CEO Scott Hardy said. “Polaroid went through its troubles, but its asset was its brand, and now we are going through a tremendous resurgence of that brand,” he said. While Polaroid has jettisoned much of the innovative tag that surrounded the original company, the current caretakers are being judicious about their licensing model. Their choices seem well-selected to avoid hitting any sour notes that would contradict what the brand has come to stand for. Also, they get high marks for clever transference of the brand’s personality into their physical locations. More details at TwinCities.com. Atari, pioneers of home video games and coin-operated arcade games with a meteoric rise in the 1980s. Today, current rights owners are struggling to escape bankruptcy and reform. Sadly, the Atari brand is a mere shadow of what it once was under its original banner. The most recent incarnation’s leadership realized too late that merely recycling its popular properties wouldn’t be enough to sustain it as an organization. But their pre-bankruptcy move into smartphone games and apps was a promising step. The jury is still out. More at PCMag. Indian Motorcyles, one-time competitors to Harley-Davidson, original company closed in the 1950s. An interesting brand that has a small-but-passionate audience, Indian is still young. But its focus on engineering takes a page from what the original company was known for, and fundamental focus on innovation rarely goes out of style. Whether this will be enough to make a sizable dent in the market versus Harley-Davidson remains to be seen. More at Fox Business.